The main types of vitamins for the memory that you should take every day are divided into three categories. Besides diet improvement, these vitamins may also be taken as supplements or vitamin pills. This ensures that the body get its daily requirement of vitamins. The main B vitamins for the memory are vitamin B6 and B12. Vitamin B6 also known as pyridoxine has been proven to be essential for good brain health and memory retention. Unfortunately according to research, most people only take about three quarters of the required daily amount. The daily requirement for Vitamin B6 is 2 mg. This vitamin is also very essential in the production of neurotransmitters such as dopamine, serotonin and nor epinephrine. Though they are some supplements that only provide vitamin B6, it is better to go for B complex supplements that provide the daily requirements for all the B vitamins. It is important to remember that overdoses of pyridoxine above 100 mg are toxic therefore medical supervision is necessary when taking these supplements. Vitamin B12 deficiency has been proven to cause memory loss, fatigue and disorientation. Besides mental problems, deficiency of Vitamin B12 is responsible for problems of the nervous system. Elderly people over the age of 60 are more likely to experience this deficiency since their stomachs lack the required amount of gastric acid to breakdown food and extract the required B12. Unfortunately, taking supplements is not effective for this group of people and therefore shots are recommended. However, with the digestive system functioning normally, the body is able to obtain the required daily intake. This is because the vitamin is readily available in animal protein and dairy products. However, vegetarian diets that eliminate dairy and other animal products from the diet could lead to B12 deficiency. The daily requirement for vitamin B12 is about 6 mg.
Fortified flours and cereals are a good source of thiamine and riboflavin. These are B vitamins that may also affect the brain and memory if inadequate. The daily requirements for thiamine and riboflavin are 1.5 mg and 1.7 mg respectively. Thiamine deficiency has also been known to cause mood changes, fatigue and irritability. 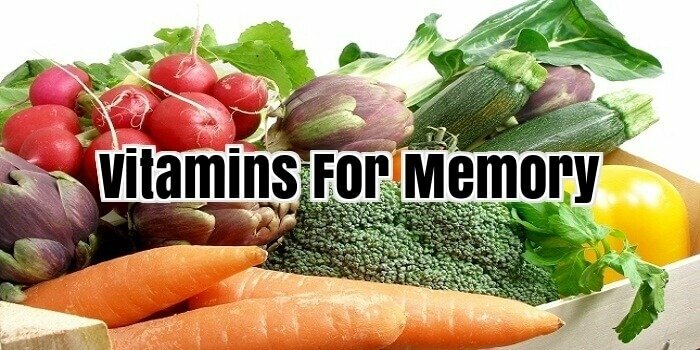 This is another category of vitamins for the memory. They include vitamins C, E and beta-carotene (Vitamin A). Their main function in the body is to breakdown free radicals that may impair the function of neurons in the brain. Antioxidant vitamins occur naturally in a variety of foods including berries (strawberries and blueberries), sweet potatoes, red tomatoes, spinach, broccoli, green tea, nuts and citrus fruits. Supplements of antioxidant vitamins are also readily available from health food stores. This is a nutrient that helps in the production of acetylcholine an essential neurotransmitter. This neurotransmitter is sometimes referred to as the brain messenger and is very important for memory. Common sources of choline include milk, eggs and peanuts. We all know that Omega-3 is not a vitamin for the memory. However it deserves a mention. They are a class of fat molecules sometimes referred to as good fats that improve brain and memory function. Food sources include cold water fish such as tuna, salmon, herring and mackerel, walnuts and flax seed oil. Supplements and vitamins for brain are important for maintaining healthy brain, good memory and other cognitive functions. Unbalanced diet, poor lifestyle, stress, smoking, alcohol, pharmaceutical drugs and polluted environment can harm brain cells and cause memory loss, problems with concentration, learning difficulties, bad mood and other problems. There is also correlation between aging process and memory decline that has been proven in different studies. Some people can start to notice signs of diminished cognitive functions in their 30’s, while for many problems become noticeable in their 40’s. And they worsen with age. That is why people under stress, older people and those with a poor lifestyle and diet habits should consider taking brain supplements. Vitamins for brain: B-complex vitamins, vitamins C, E and carotenoids are essential vitamins for brain that protect against damage done by the free radicals and improve brain functions. They also protect against heart disease, cancer and aging process. If you do not have a balanced diet or you live a stressful life, consider taking vitamin supplements that can be taken as separate vitamins or as a multivitamin supplement. B-complex vitamins: They improve brain health and immune system. B vitamins protect brain tissue against oxidation and preserve aging brain; they help body in production of neurotransmitters and have a significant effect on the memory improvement. They also help in brain development and protect against some brain related diseases. B vitamins are especially important for people under stress who should consider taking a B-complex supplement. Vitamin E is important antioxidant and vitamin for brain that prevents damage done by the free radicals, inhibits the aging process and is believed to delay the progress of the Alzheimer’s disease. Vitamin C is another antioxidant and an important vitamin for brain that protects against free radicals that cause oxidation in brain. Brain is known as a hungry organ that needs a lot of nutrients and energy to function well. A healthy diet and supplements for brain can help to improve intelligence, memory, emotional well-being and other brain functions.